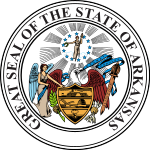 The 2008 United States Senate election in Arkansas was held on November 4, 2008. Incumbent Democratic U.S. Senator Mark Pryor decided to run for a second term. No Republican filed to challenge him. His only opponent was Green Party candidate Rebekah Kennedy. He won re-election with almost 80% of the vote. Kennedy received the highest ever vote share of any Green Party candidate running for U.S. Senate. As of 2019, this is the last U.S. Senate election in Arkansas won by a Democrat. On March 10, the state Republican Party announced it has no plans to field a candidate against Pryor. The only Republican to express interest in the race, health care executive Tom Formicola, decided not to run the weekend before filing began. Formicola lost the GOP primaries for the Senate in 2004 and the U.S. House of Representatives in 2006. As a result, Pryor was one of the few freshman Senators to face no major-party opposition in a reelection bid. There had been speculation that former Governor Mike Huckabee would run against Pryor if his presidential bid were unsuccessful, but on March 8, Huckabee said he would not contest the race. Pryor's biggest challenger was Green Party nominee Rebekah Kennedy, who entered the race in April 2007. Kennedy became the sole challenger of Democratic Senator Mark Pryor in his first race as an incumbent due to the GOP declining to nominate anyone for the race. Kennedy received a 206,504 votes (20.54%). This is the highest percentage of the vote for any Green Party candidate running for U.S. Senate ever, and her 206,504 votes is the second most total votes received by a Green Party candidate for U.S. Senate after Medea Susan Benjamin's 326,828 votes in the 2000 California Senate race. Kennedy's campaign, in addition to being record breaking for the Green Party, was also the strongest showing of any independent or third party candidate running for the U.S. Senate in 2008. Pryor was polled at 90% in a poll without a challenger in March. ^ "Today's THV - KTHV Little Rock News Article". Todaysthv.com. March 10, 2008. Retrieved July 26, 2012. ^ "Kennedy enters race for Pryor's Senate Seat", Daniel Nassaw, Arkansas Democrat-Gazette, April 14, 2007. ^ "U.S. Senate Statewide Results". Secretary of State of Arkansas. Retrieved 2009-04-09. ^ "Arkansas Polls". Electoral-vote.com. Retrieved July 26, 2012. ^ "U.S. Senate Statewide Results". Secretary of State of Arkansas. December 2, 2008. Retrieved December 9, 2008.